After an extensive USD$65 million major makeover the former Hotel Miramar in the heart of Tsim Sha Tsui (TST) reemerged as The Mira in 2009 with Katy Perry performing at its opening and becoming the first hotel in Hong Kong to join the Berlin-based global Design Hotels Network. So what exactly is a Design Hotel? Thought-provoking design is probably in the eye of the beholder but the “Original” of Mira is certainly no ordinary person. Martin Lee, CEO of Miramar Hotel and Investment Company is also the vice-chairman of Henderson Land, one of the largest real estate developer in Hong Kong majority controlled by his father Dr Lee Shau Kee who according to 2015 Forbes Billionaires list is the 27th richest man in the world! Going back on subject, The Mira offers 492 stylish five-star guest rooms in a choice of red, green, silver or purple colour schemes furnished in designer fabrics and features Arne Jacobsen’s iconic “Egg Chair”, first designed and produced for the lobby and reception areas for the Royal Hotel in Copenhagen, to match each colour scheme. There are 56 suites in total which all reflect the hotel’s styling flare and pared-down luxe. On our visit, we stayed 7 nights in the very spacious green-themed mira suite 80, boosting over 52 square metres of contemporary space (generously large considering Hong Kong has one of the world’s highest real estate prices). Our suite featured a separate lounge with its own guest bathroom and study desk which could easily accommodate 6-8 guests for a catch up drink/coffee using the in-room Nespresso coffee machine or included mini-bar. The bedroom offered a King bed with an extensive pillow menu, a large walk-in wardrobe (particularly convenient when you’re staying a while and don’t travel light) and really plenty of space to spread out. The jewel though has to be a to-die-for striking, high contrast bathroom with double basin, bathtub, rain shower and private steam room that we just wanted to bring home. Oh! and I almost forgot the in-mirror TV which obviously is a must have for any luxe bathroom. 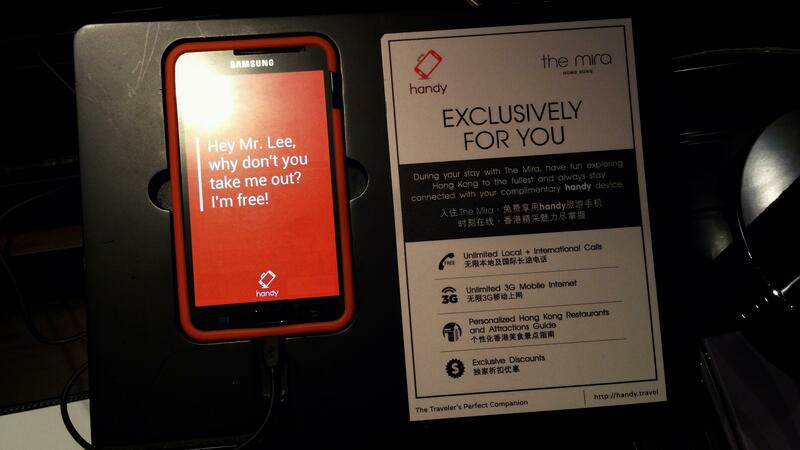 Priding itself as an innovative and tech-friendly upscale hotel, another great feature from The Mira is this smartphone that you can take with you out and about. With unlimited 3G connectivity and FREE, yes FREE! local and International phone calls to 25 popular destinations including Australia, New Zealand, UK, US, Canada, China, Singapore, Japan etc it definitely fits the modern connected lifestyle of many discerning business/leisure travellers alike. The call quality is surprisingly good and personally I found it a major convenience. The smartphone also has popular apps pre-installed like Facebook and when you’re done with the phone, there’s a “Delete Personal Data” button that removes your history/personal information from the phone. To top things up, our Suite 80 had stunning views of Kowloon Park and beyond, capturing modern skyscrapers like Hong Kong’s tallest 118-storey International Commerce Centre at 484m (Ritz Carlton Hong Kong occupies levels 102 to 118. Read my review on Tosca, the famed Italian restaurant on level 102) to the left; and the second tallest 415m Two International Finance Centre (Four Seasons Hong Kong stands within the IFC development) to the right. This Suite will be a perfect vantage point to see the fireworks on days such as NYE or Chinese New Year, but then I’m sure prices will quadruple if not more. There are six onsite restaurants at The Mira, from contemporary European to modern Chinese, including a stunning fifth floor rooftop garden lounge/al fresco venue, perfect for unwinding in style and exclusivity. If you don’t fancy any of these restaurants, then there are plenty more options at the connected Mira-Mall and Miramar Shopping Centre. Mira Mall is in the same building as the hotel and the larger Miramar Shopping Centre can be accessed on ground level or via the foot bridge on level 3. Alternatively, being in the heart of TST, there are plenty of options just outside your door-step. Having stayed a week, not dissimilar to other hotel stays, the buffet breakfast can get a bit boring. Not that there wasn’t enough variety of food to choose from but the lack of variation by day was a slight let down. Another odd set-up is, unlike all hotels I’ve stayed in, Suite guests don’t get access to the Mira Club located on level 15 which offers the standard evening cocktails and canapes unless you booked directly with the hotel. Considering Suites are more expensive than Club rooms, I found this rather bizzare. In the third basement level of the Mira lies a 18,000 square feet wellness zone that includes an inviting 25m indoor infinity pool, sauna and steam, a 24 hours fitness centre and the award-winning MiraSpa. Treatments are not inexpensive at the Spa but again my wife seemed to have thoroughly enjoyed her few hours there and as they say “happy wife, happy life“, so it’s all worth it. You can’t fault the Mira’s location in the heart of TST, there’s a MTR station within 5 minutes walk and if you want to go over to Hong Kong Island, the scenic and much-loved Star Ferry ride across Victoria Habour is less than a 15 minutes stroll. Convenience does come at a price though. TST being one of the most popular tourist hubs in Hong Kong is packed on most days and nights, and jammed silly on festive dates, which can be overwhelming if you’re not use to big city life. The other problem is you almost have to fight for a taxi despite there being a taxi stand right outside the hotel. The demand is unbelievably high so make sure you leave plenty of time to catch your ride. Whether you appreciate its design or not, overall, the Mira is a great place to stay if you want to be in the centre of all the action and at the same time enjoy true five-star luxury. Personally, we’ll probably opt for another place on our next visit to Hong Kong that’s more baby friendly (i.e. less crowded).